In this short post, we are going to see the visual representation or ‘visual proof’ of this property where it is represented as area. However, one limitation of this representation is it does not represent negative values for , or . This means that this is only good for positive numbers. 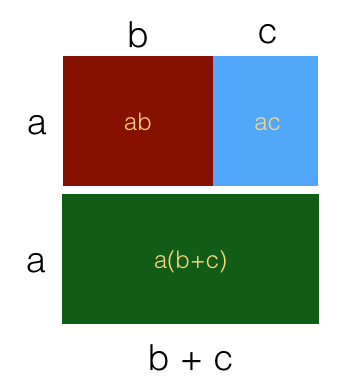 In the diagram below, two rectangles (red and blue) are placed adjacently. The have the same height . The red rectangle has width while the blue rectangle has width . As you can see, this is the distributive property of multiplication over addition.